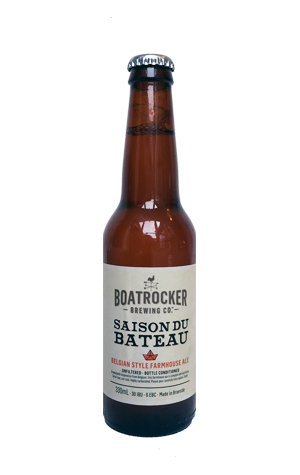 Given their growing popularity with Australian brewers and drinkers – and Boatrocker's love of all things Belgian – it's perhaps a little surprising that, two and a half years after installing his brewery in Braeside, Matt Houghton and his team still hadn't released a saison. There had been some teasers along the way – we seem to recall a brettanomyces saison making an appearance at a Good Beer Week event – but nothing on any grand scale. So now they're rectifying things with two takes on the style released at pretty much the same time. One is this Saison du Bateau, a pretty straightforward take on the French / Belgian farmhouse style that's become part of the brewery's permanent range, the other Gaston that you'll find elsewhere on the site and, initially at least, only for sale at the Barrel Room in Braeside. Du Bateau is a pale golden, slightly hazy affair that offers up an array of pilsner malt sweetness, some citrus aromas and plenty of spicy characters from the yeast – both of the peppery and clove varieties – before finishing with a prickly dryness. Or, as the brewery puts it: "A line and length saison." UPDATE: In a blind tasting of Australian and classic international saisons in 2016, Boatrocker's came out on top – read the article here.